A program can wait for incoming connections. The program can just listen for a connection and can be in the ready-to-connect state. 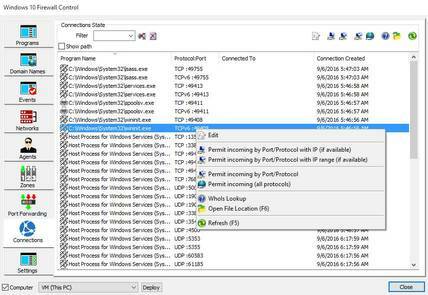 The connection itself may be not established yet, so the program may be not detected/listed by Windows 10 Firewall Control automatically yet. The detection (automatic listing) is made on a connection attempt, the detection can not be caused by ready-to-connect state of a program only. However Windows 10 Firewall Control lists all waiting for a connection programs in the Connections pane. The pane shows all ready-to-connect programs, displays the expected connections parameters (protocol:port), displays the connection state and the creation time (if available). Protocol:Port used for an expected or established connection. Connected to displays the connection destination, if the connection is already established (TCP only). Connection Created displays the timestamp of the ready-to-connect initiation (UDP only). Inserting/protecting an unlisted program that is the ready-to-connect state in advance. Editing a program permissions, if the program is listed already. 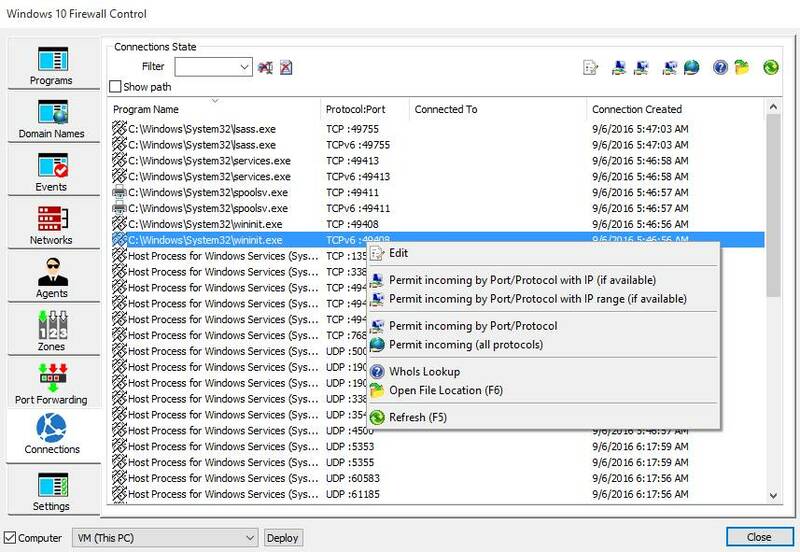 Patching the security zone of a program by inserting the connection related permissive or blocking rule. There are several options available via the toolbar and the context right click menu. The options allow creating the rule with/without the listening port and/or using the destination IP (if available) or an IP range (Plus Edition). If a connection is already established, you can reveal the connection destination details by using the free independent online WhoIs service.